Result: Won 4-3, 4th Round of Qualifying for the US Open Cup. 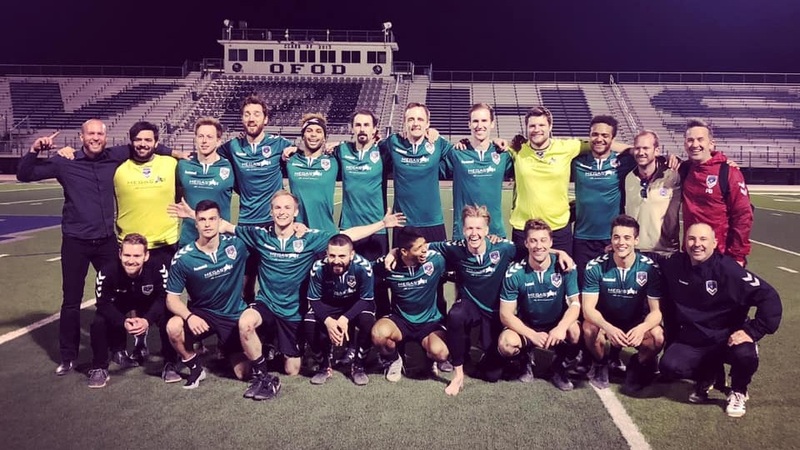 Qualified for our second and consecutive Open Cup. Next Up: Sunday, April 14th vs Colorado Rovers at Broomfield Commons, 3 pm. Recap: The weather was perfect for a Sunday match up against a scrappy Boulder side. FC Denver United controlled the tempo from the opening tap on the bumpy grass field that led to several misplayed balls and turnovers from Boulder. Denver's great possession halfway through the first half led to a foul 5 yards outside the box. Julian buried the free kick, beating the keeper low off the far post and in. Denver continued to control the game and Luke came up with a big goal with about 10 minutes left in the half. The back-line from Denver limited Boulder's chances and ate up any counters that came their way. Boulder came out in the second half with some energy, and Denver matched their tempo. Denver had solid play in the midfield from David, Ryan, and Stephen to control most of game and come up with big tackles. For the last goal, United played a quick ball up field to Alan who broke out into the open field and found a streaking Jeremy all alone. Jeremy took the left footed shot from 25 yards out and beat the keeper in the side netting with a great finish. Center backs Nick and Chris took care of any last ditch efforts from Boulder to try to get on the scoreboard, and Josh came up big in goal in the second half to maintain the clean sheet. Overall a great team performance and huge 3 points to move up in the Premier Division table. Next Up: Sunday, April 14th vs Atlas at Broomfield Commons, 1 pm. Recap: All things considered a solid performance for the U19s today — we improved our goal differential by 4 and earned 3 more points to move up the CPL Elite Men’s table in a decisive 5-1 comeback win over a super scrappy / chippy Lobos FC. We kept our cool and forced the play at times. We need to do a much better job of keeping possession but did much better in changing the point of attack. Defensive shape was really good with game captains Bryan Torres and Blake Bennett manning the nets and right back positions respectively. Rene Perez, Benji Gutierrez and Miles Zerwas rounded out our back line and all had a solid performances, individually and as a unit. We played a conservative 4-2-3-1 to anchor down our back line and pressed well to force multiple counterattacks. Marko Babiak, Rawson Welch and Justin Reese provided balance and grit in the midfield, winning tackles and launching effective counterattacks. Enock was "ice as usual” in front of the net. Lobos presented a weak back line and rarely used their midfield, so we just made them boot it — lots of punts to win! MOTM Benji Gutierrez collected most air balls with ease and we ran at them with numbers. We had spells of possession but most of their first instincts were to play direct. Next Up: Sunday, April 14th vs Rovers at Broomfield Commons, 5 pm. Recap: Masters defeated Real Colorado 3-0 to bounce back from last week's tough loss to ACSL. We were lucky to catch Real today without their best player and short handed, after an injury they had to play with 10 in the 2nd half. But regardless, they were a handful as always with their physical play and an aggressive front attacking three. Derek Moore played a nice thru ball to Simon Logan midway thru the 1st half who was tripped up for a PK. Moore calmly finished it to the left corner to take us into the half ahead 1-0. The second half was scrappy with emergency defending on both ends, but finally things opened up in the final 20 minutes for Noone to be slipped thru the Real backline for two additional goals to continue his red hot start to the season. Props to the backline of Moschel, Wilson, Kerzner, and Logan to keep a clean sheet for Matt Burford's return from injury in goal. Next Up: Sunday, April 14th vs Victoria Kickers at Kickers Clubhouse, 3 pm. Recap: Legends faced an undermanned Union Jerez squad this Sunday, winning 7-0. We came out a little slow, but netted our first goal about 10 mins in. The first half finished with FC Denver up 4-0 with goals from Garrett, Marco, Felipe and Kyle. Second half we came out with some high pressure, but could not score early, which led to a few counters by Union Jerez. Our defense remained strong and we were able to crack in 3 more in the second half. Two goals by Nick and one by Brady. Legends continues its streak of shutouts, currently at 3 matches. Man of the match was Nick D with his 2 goals and pressing runs on the wing. Next Up: Sunday, April 14th vs Denver City Lions at Dove Dolley, 9 am. Recap: FC Denver Women’s Team also faced an under-rostered Union Jerez. Our unstoppable focus led to 7 goals in the first half. Hirschman cracked the first one assisted by Muther in the first 90 seconds. Minutes 8, 12, 14, and 16 brought in goals from Muther, Centi, and two goals by Devitt with contributions from Ammaturo, Centi, and Devitt. The last fifteen minutes saw a goal by Marisa, assisted by Silvestrone and a final goal prior to the close scored by Morgan. Union Jerez women played their best, but could not keep up with our fully rostered team.. The close of the half also wrapped up the game. Next Up: Sunday, April 28th vs Azteca Women at Dove Valley, 3 pm.